Being able to see through walls is definitely a superpower I would pay to have. And while it’s not entirely possible yet, researchers at MIT’s Computer Science and Artificial Intelligence Lab are pretty close. 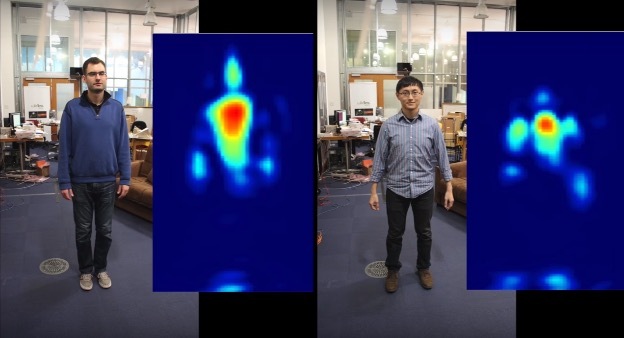 They’ve built a device, called RF-Capture, that uses Wi-Fi signals to identify and monitor human silhouettes through walls. It works by emitting wireless signals through the walls, which then bounce off the human bodies on the other side. As the person moves, the RF-Capture takes snapshots in order to stitch the images together and create a silhouette. It may seem basic at first to some people, but the researchers have said that it’s sophisticated enough to tell the difference between fifteen different people and even analyze a person’s heart rate and breathing pattern. I mean the obvious use for this is to spy on the people next door, but MIT has grander plans, saying it could be used in movie-making – actors have to wear markers on their bodies for motion capture at the moment, but there’s no need for them with the RF-Capture. The team is also working to develop a spin-off device that can be used in the home for eldercare and could be set to call emergency services if someone falls. It could also be programmed to manage things like lighting, heating and the TV as well.